I spoke today in my home ward as the high council speaker. I had self-reliance as the topic for my talk. On the one hand, I had plenty to say since I've had my head in that space for the last couple of years. On the other hand, I had too much to say for the same reason. I wanted to create something I could share with others and I wanted to make sure I said it right, so I wrote everything out. I think that allowed me to say the right things, but then I also read too much from my talk and spoke too fast. I opened with a reference from Indiana Jones. In Indiana Jones and the Last Crusade, the title character finds himself facing a series trials to reach his goal. 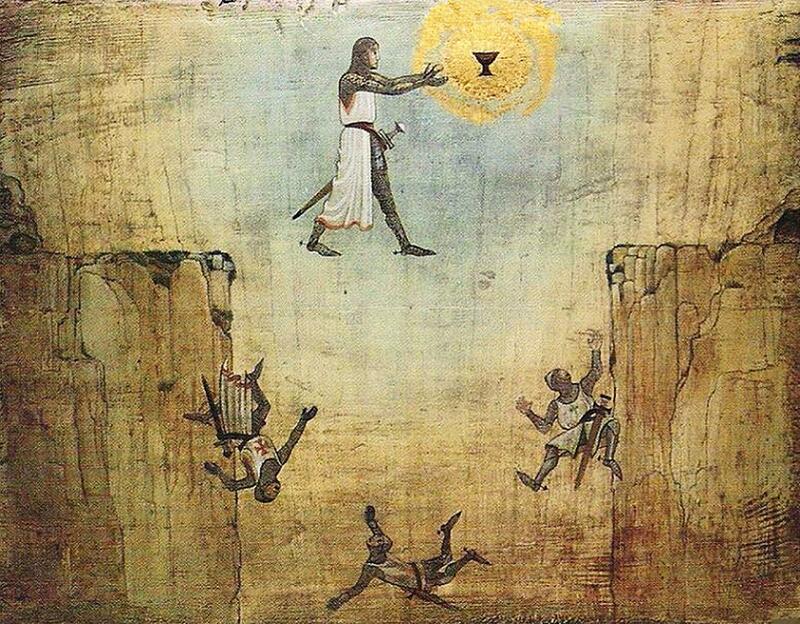 The third challenge, also called The Path of God, consists of Dr. Jones facing a deep chasm without a clear way across. He consults his father’s trusty diary, which states that “only in the leap from the lion’s head will he prove his worth.” Indiana then takes “a leap of faith” and steps out into the abyss. He’s then relieved to find himself supported by a camouflaged bridge that he then successfully walks across. Nephi provides “a leap of faith” example at the beginning of the Book of Mormon. After two failed attempts to obtain the brass plates for his family, Nephi goes into Jerusalem on his own. “And I was led by the Spirit, not knowing beforehand the things which I should do” (1 Ne 4:6). We read that this third time proved successful, with Nephi and his brother returning to their father in the wilderness with a record of the Jews. Even though he did not know how, Mr. Go and Do . . . went and did. I share these two stories because I’ve had a similar experience during the past few months while serving on the Stake Self-Reliance committee. Many aspects of that committee’s efforts this fall have required us to take a leap of faith, where I define “us” there as those on the committee, those wanting to sustain the committee, and those wanting greater self-reliance throughout the stake. I do not think the requirements for leaps of faith will stop, but I can hopefully use my time today to give a little perspective on the leaps already taken. I'll start by defining self reliance. In last week’s Gospel Doctrine class, Sister Work collected suggestions for attributes of a self-reliant person and wrote them on the board. We came up with the following: Confident, Find solutions, Proactive, Quick to observe, Find needs, Full of faith, Adaptive, Thrift & industry, Prayerful, Teachable, Practiced, Sharing. An excellent list, and each attribute could provoke a sermon. The Church Handbook of instructions defines self-reliance as “the ability, commitment, and effort to provide the spiritual and temporal necessities of life for self and family.” Think about everything packed into that little definition. Self-reliance considers both temporal and spiritual necessities. Improving self-reliance might not just require a greater effort and commitment; part of it consists of our skills and abilities. Think about examples of self-reliant people in your life. Now think about the ultimate example of self-reliance, and the only person on this planet to ever truly be self-reliant: Jesus Christ. What does that tell us about self-reliance? First, the quest for self-reliance becomes part of the quest for becoming Christ-like. It’s a continuum. We do not ever “arrive” at self-reliance in this life, we merely become more self-reliant. If during this talk you're thinking "I hope so-and-so is listening" or "to bad so-and-so isn't here" then you've missed the point. We can each be more self-reliant. Second, we must decouple self-reliance from money. Nothing from the Bible indicates that Christ had earthly wealth. Self-reliance is not a retirement goal, nor is it just a function of debt and welfare support. It’s about learning to recognize the gifts we’re given and utilize them to their fullest potential. Third, self-reliance is something different from independence. Christ had family. Christ called apostles. They served Him, and He served them and others. Going back to the Church Handbook: “As members become self-reliant, they are also better able to serve and care for others. Church members are responsible for their own spiritual and temporal well-being. Blessed with the gift of agency, they have the privilege and duty to set their own course, solve their own problems, and strive to become self-reliant. Members do this under the inspiration of the Lord and with the labor of their own hands. Did you catch that? It bears repeating. It said spiritual AND temporal again. We have responsibility for our own well-being in both aspects. When we need help beyond our own capability, we turn to our families first. If our need surpases that capacity, THEN “the Church stands ready to help” in both spiritual and temporal things. Allow me to clarify a few things about that. I repeat that independence is not equivalent to self-reliance. Neither the spiritual nor temporal aspects of self-reliance require us to become hermits. I would argue that becoming a hermit actually makes one LESS self-reliant. Again, look at the example of Christ. Do not wear perceived self-reliance as a badge of self-gratifying pride. Wearing anything as a badge of self-gratifying pride is a bad idea, but this particular trophy seems to be something we still gravitate towards achieving. The guiding principle of self-reliance (and of this entire life) is maintaining our agency. We should strive to increase our ability to choose, and unhealthy dependence on others, spiritually or temporally, can rob us of that ability. First, self-reliance is an essential commandment in the plan of salvation or, as it is sometimes called, the plan of happiness. Second, God can and will provide a way for His righteous children to become self-reliant. “And it is my purpose to provide for my saints, for all things are mine” (D&C 104:15). Third, all things, including temporal concerns, are spiritual matters to God (see D&C 29:34). As we commit to living the gospel more fully, we can become more self-reliant both temporally and spiritually. President Hinckley announced the Perpetual Education Fund in 2001. This “loan program helps members of the Church of all ages get an education that leads to a self-reliant job.” While helping 80,000 individuals all over the world, it did not have the original envisioned impact of raising self-reliance throughout the church. The church commissioned a group to study the long-term direction of the Perpetual Education Fund in 2012. The Self Reliance Initiative formed as a result. I noticed the Self-Reliance Initiative materials on the Gospel Library App in 2015 while serving as the Ward Employment Specialist. They looked like excellent resources, but not something I could roll out on my own at the ward level. So I waited. The First Presidency introduced Self-Reliance Services in North America at the end of 2015. It was a busy year. Self-Reliance Services first showed up in the Nashua Stake at the start of fall 2016. I went to one meeting talking about it. Then something else happened later that fall: we formed the North Shore Stake. With everything else to do, the Self-Reliance Initiative rollout got paused for our new Stake. Our new Stake Presidency received training on the Self-Reliance Initiative at the start of last summer. At the end of the summer we called our Stake Self-Reliance Specialist, Brother Stephen Day of the Methuen Ward. In September we established and started training our Stake Self Reliance Committee. Our first My Path to Self Reliance devotional took place on October 29th. We now have eight self-reliance groups occurring throughout our Stake. What does that even mean? The Stake Self-Reliance committee meets regularly to review and plan for all self-reliance needs in the stake. We are still working to figure out what that means in practice. Our primary tool at this point consists of the My Path devotional and the Self-Reliance groups. We had our first Stake My Path devotional a few weeks ago, and will have another in three months. These devotionals introduce the principles behind the Self-Reliance Initiative and help participants find the self-reliance group that will help them reach their self-reliance goals. The devotionals also act as a peek into the format for the group meetings. There are currently four specializations for group work: Starting and Growing My Business, Personal Finances, Find a Better Job, and Education for Better Work. Group members discuss common self-reliance principles and the principles specific for their group’s specialization. Groups do not have a teacher or a leader, but instead use a facilitator. Each week the manuals provide what essentially amounts to a script for studying the topic as a group and then setting goals. The facilitator makes sure the group correctly uses the material and stays on task. The facilitator does not teach the material. In many ways, each group follows a council model, teaching each other in the Savior’s way. Most of the progress towards self-reliance takes place between group meetings, as participants support each other and hold each other accountable in their progress toward goals. At this point in the narrative we have learned enough about Laman and Lemuel to not really expect much better of them, but I still find it interesting that nobody else among the families had replaced their bows previously, and suddenly there’s no more mention of the slings from a few verses before. It seems that even Lehi, the patriarch of the family, had succumbed to murmuring like everybody else. “31 And it came to pass that I did slay wild beasts, insomuch that I did obtain food for our families. During this Thanksgiving season, let us be grateful for what we have. Let us also ponder how we can better use those gifts to serve others. Please plan on attending the next My Path to Self-reliance devotional in February. We may not be able to see the whole road yet, but we can still be thankful it is there.